Bunjurgen Estate verjuice, wines and ports are made at Ballandean Estate winery located at Ballandean on the Granite Belt just south of Stanthorpe. Ballandean Estate has a well-known reputation as a leading Queensland winery and the winemaker and the Bunjurgen Estate executive tasting team deliberate and discuss each year’s vintage and ensure that the verjuice, wines and ports produce a unique finish and our desired market appeal. Ballandean Estate produces, bottles, labels and packs our wine for return to Bunjurgen Estate where it is stored in a controlled climate environment between 15 and 18°C, and then sold from our Cellar Door to both individual and corporate clients. The cool Barrel Room is the scene of pleasant summer tastings - a much sought after haven, when the outside temperature is in the fiery 40-degree range! Our ports are returned from Ballandean Estate in bulk, and then transferred to barrels which are stored in our Barrel Hall for the necessary periods – 6 years in the case of our Bunyip Port – lesser with the White and Cherry Ports. The ports are decanted and the required volumes are sent to the Hunter Valley for bottling and returned to Bunjurgen Estate for sale. All grape picking at Bunjurgen Estate is done by hand to minimize berry trauma and to reduce the opportunity for fermentation to commence before crushing. The picking process traditionally commences with a BBQ breakfast at 4:30 a.m. to ensure that the grapes are picked in the cool of the morning and transportation to the winery occurs in refrigerated trucks. Work starts at 5.15 a.m. and is generally completed by 10.00 a.m.The picking days are scenes of great activity with upwards of 40 people involved in picking, transporting, sorting and quality control activities. Legendary hospitality is afforded to all pickers and all participants enjoy the event. If you would like to participate, please put your name down with us and we would love to see you – there is a remuneration scheme!! In 2000 the idea arose of establishing a vineyard in the Boonah area following a six weeks long tour of vineyards in the Barossa Valley, McLaren Vale, Clare, Limestone Coast, Coonawarra, Yarra Valley, Canberra - Yass, Hunter Valley, Hastings River, New England plateau, Granite Belt and the Scenic Rim of Southeast Queensland. Over 70 vineyards were visited and very keen observations made of viticulture, winemaking and sales activities. An analysis of the necessary parameters for successful winegrowing was made with the assistance of the University of New England and following successful soil tests the initial vines were planted at Bellbrook in August 2003. 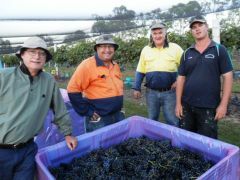 These vines were grafted Chambourcin cuttings procured from the Mildura region. Grafted Shiraz cuttings were planted in 2004 and additional Chambourcin vines were planted in 2005. A total of 2200 vines comprise Bunjurgen Estate. The vineyard is watered using a drip irrigation system connected to a deep bore, and the amount of watering is controlled using a water balance philosophy, which calculates the transpiration rate of the vines and the necessary demands of both growing and fruit load. This approach ensures optimal moisture and maximum water efficiency. The vineyard has a modified Scott - Henry trellis system designed to ensure that the vines are provided with the best conditions to resist mildew and various other fungal attacks. Southeast Queensland has particularly high levels of humidity in the early mornings during spring and autumn as well as the classically high levels associated with summer rainfall and the storm and monsoon season. This trellis system, in conjunction with contemporary preventive mildew regimes, is a characteristic of the Bunjurgen Estate approach to viticulture. Canopy management is of paramount importance and great efforts are made to ensure air flow and sun access within the vine area. The vineyard is protected from both bird and flying fox attack by permanent netting which has a hail preventive upper mesh to resist hail damage. The netting also provides a 7.5% shade factor, which allows berries to remain on the vines longer for ripening and produces a superior set of wine characteristics as a result. Inter row strips are grassed to prevent erosion during heavy rain and all grass cuttings are mulched back into the vineyard. The story of Bunjurgen Estate traces its heritage from the very early days of convict transportation to the Colony of New South Wales. John McMaugh, an Irishman, was transported and served his sentence on a series of cattle properties in the Macleay River valley, which is very close to Port Macquarie. Port Macquarie was a cruel and hated convict settlement with harsh living conditions and extremes of physical punishment. Granted a ticket of leave after seven years, he worked, and ultimately selected a grazing station, Pee Dee Station, in the Upper Macleay Valley of New South Wales. Caroline Blake, her birth certificate marked: "born to a convict mother on His Majesty Ship off the Coast of New South Wales", married John McMaugh in 1842, aged 16 and named the local area Bellbrook, and their selection Pee Dee Station. Caroline’s mother, born in 1795 in Ireland, was transported as a convict, and who lived for the remainder of her life in Australia is buried on Pee Dee Station under a graceful white cedar tree, a true Australian pioneer woman, remembered as a great lady. 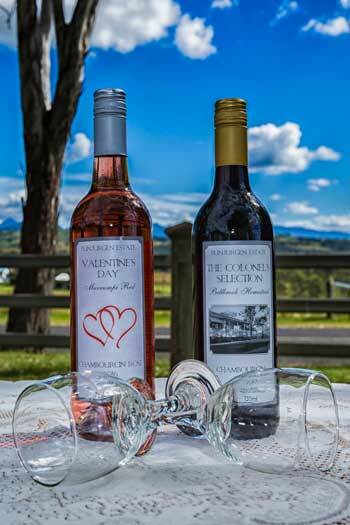 Four generations later, a descendant of the original McMaugh family established a vineyard selection in the Teviot Valley, near Boonah in Southern Queensland in a location known locally as Bunjurgen. The property was named "Bellbrook" after the original area named by Caroline McMaugh in the Macleay Valley in 1842. A fitting historical touch. Whilst the privations of the convict era are no longer present, the hard physical work and continual demands of establishing and developing a vineyard have a contemporary parallel with John McMaugh’s convict experiences of Port Macquarie 175 years ago.